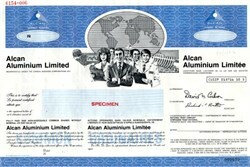 Beautifully engraved SPECIMEN certificate from Alcan Aluminum Limited. 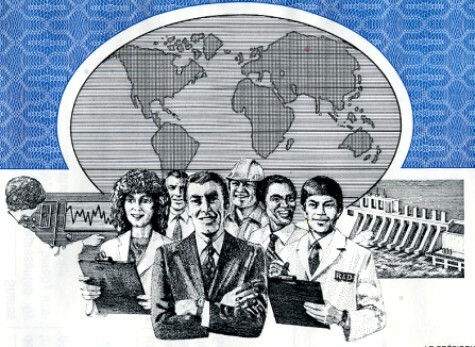 This historic document was printed by British American Bank Note Inc. and has a block border around it with a vignette of workers under a map of Earth. This item has the printed signatures of the Company's President and Secretary. With approximately 88,000 employees in more than 60 countries, Alcan has leading positions in raw materials, primary metals, fabricated products and packaging. These include products and systems for the automotive and mass transportation markets, aluminum sheet for beverage cans, as well as flexible and specialty packaging for the food, pharmaceutical and personal care industries worldwide. Alcan is also a combination of world-class smelting business, leading smelter cell technology and leading rolling businesses that creates a world-leading aluminum company and a US$6 billion global leader in packaging.